Here’s Felix, 10-29 to 11-4-1934. Felix visits the county fair this week. Lots of sideshow type fun at the carnival, such as the grouchy fat man who trips over Felix in the fat man’s race, then rolls over the finish line. He’s grateful to Felix and calls him a lucky cat in the 11-1. Watch that snake charmer in the 11-3, he comes back into the dailies next week. In the Sunday from 11-4, Felix is happy to be back on dry land and takes shelter in a pet store. There, he is observed by a rich dowager and her little boy, Milton. The dowager buys Felix for Milton but his father “don’t approve of him–bah”, as he exclaims in the last panel. I love how merry Felix looks even though he isn’t in a loving household like Danny Dooit’s. Myrtle is from 8-2 to 8-8-1948 this time out. In an idea that Ward Greene originated in his “Happy Dan, the Whistling Dog” short story from 1937, Myrtle decides to teach Bingo to whistle. (Ward Greene’s story inspired the Disney feature cartoon, “Lady and the Tramp”, and in comic strips, Greene created Scamp, the strip about Tramp’s little son.) Almost immediately, Bingo begins annoying the community with his new skill. Slug thinks that Bingo is his girl in the 8-6. Apparently, Slug and his girl have a secret whistle signal to each other and Slug winds up kissing Bingo after hearing his whistle. Even Junior, Bingo’s canine sidekick develops a super powerful whistle in the 8-5 that nearly busts Myrtle, Sampson and Bingo’s ear drums. The Sunday shows Mac and Freddie camping out with a 1948 television receiver and a portable refrigerator while everybody else prefers a primitive campsite. Krazy is from 11-9 to 11-14-1942 for this round. Garge continues the Cow Jumped Over the Moon jokes from last week. 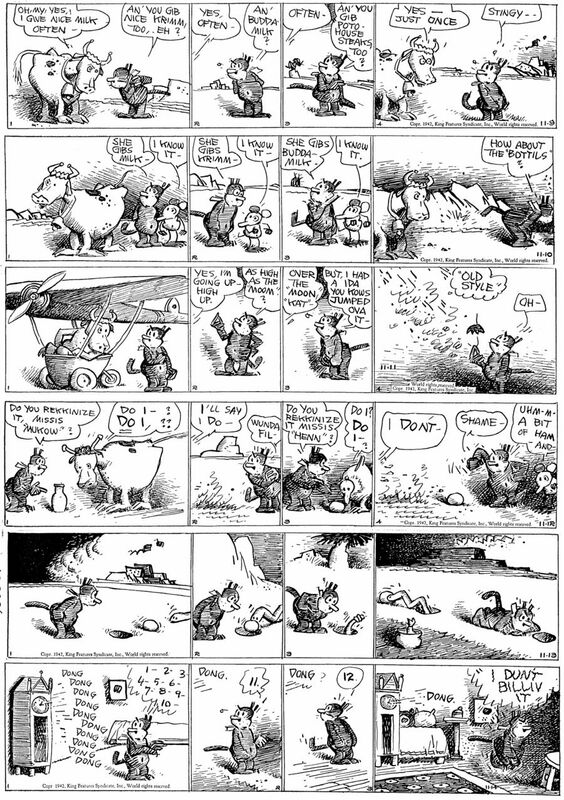 In the 11-12, the cow and a hen seem to be imitating Frank Nelson from the Jack Benny program as they both use his catch phrase, “DO I!” The shifting Coconino backgrounds are outstanding in the 11-13, especially the mountains evolving out of clouds in panel two, and the mesa emerging from darkness in panel four. In the 11-14, Krazy reacts in a Yiddish accent to a grandfather clock that chimes 13, as he cries out: “I Dun’t Billiv It”! The Ranger and the Indian tribe appear twice in the Yogi Bear Sunday pages from October, 1965. 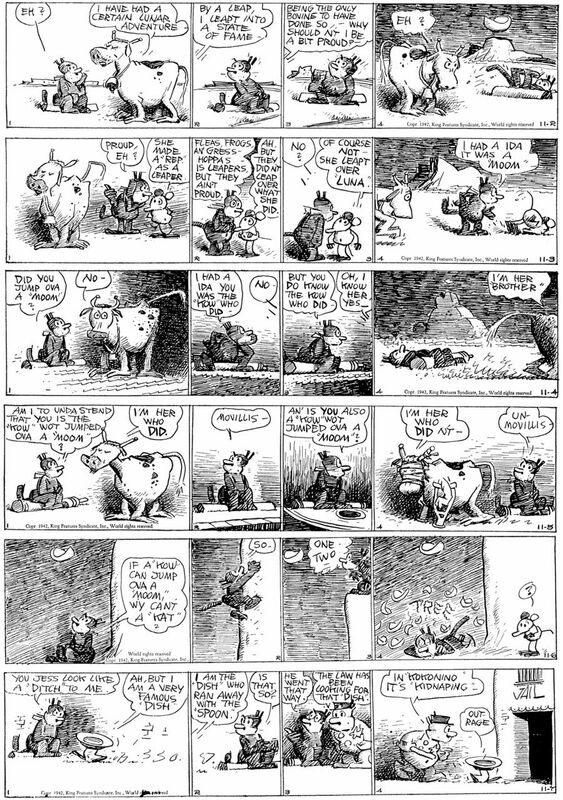 The cartooning is good in these strips, might be by Iwao Takamoto or Jerry Eisenberg, or a combination of both. Yogi’s solution for getting his head caught in a bee hive is very similar to Groucho getting his head caught in a big jar in “Duck Soup”, they draw faces on the surface of the hive and big jar to disguise themselves. In the 10-21, the Ranger tries to tie down an apple tree so that Yogi won’t bump into it and smash the greenhouse glass panes with the apples. In “Moon Mullins” fashion, Yogi trips on the rope and smashes the next two greenhouses in line with the apple missiles. We’ll have more comic delights here next time. Felix from 10-22 to 10-28-1934 features a horse that Felix is grooming for racing at the County Fair named Dobbin. Dobbin can’t race because the judges grabbed his horse shoes for a pitching contest. The 10-26 features a black guy who is confused with an eggplant and in the Sunday page, Felix gets booted back to land after consuming the entire day’s catch of fish. Dig that cat design in the “Laura” topper, he resembles Krazy just a bit. In Myrtle, from 7-26 to 8-1-1948, Sampson sews up Freddie’s shower curtain and turns on the cold water after Freddie refuses to talk to him, Susie spanks Myrtle for sitting in the corner instead of standing in the corner in the 7-31, and in Dudley Fisher fashion, this action occurs BETWEEN panels three and four. In the Sunday, the whole town goes on a picnic by the lake and Myrtle goes skinny dipping, refusing to come out even when it rains. Krazy, from 11-2 to 11-7-1942, has Garge in a literary mode, doing a whole week’s worth of strips based on the old nursery rhyme; “Hey, Diddle Diddle”. The cows and the bull in the first 4 strips sport rather outlandish feet, more like human hands than hoofs. Krazy tries to jump over the moon in the 11-6 and Offissa Pupp is definitely not the little dog who laughed as he truculently jails the dish for “kidnaping” the spoon! CU soon! You are currently browsing the Mark Kausler's CatBlog blog archives for September, 2015.